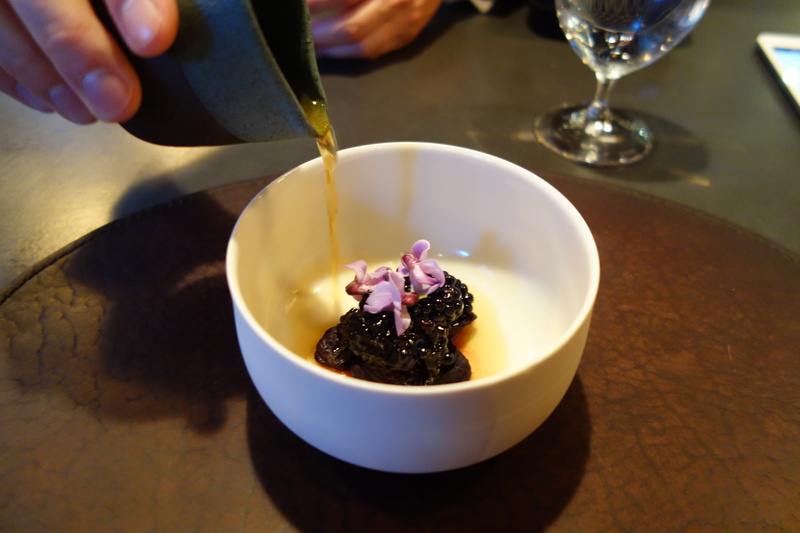 Supply: Fine-dining has never been better world-wide, with an increasing ferment of ideas from chefs globally as they exchange ideas over Twitter and Instagram. Many recipes are freely shared over the Internet. Inspiration is nothing more than a Follow on a great chef’s Twitter account away. So there is a large volume of information and combinations which are waiting to be tested on discerning diners. 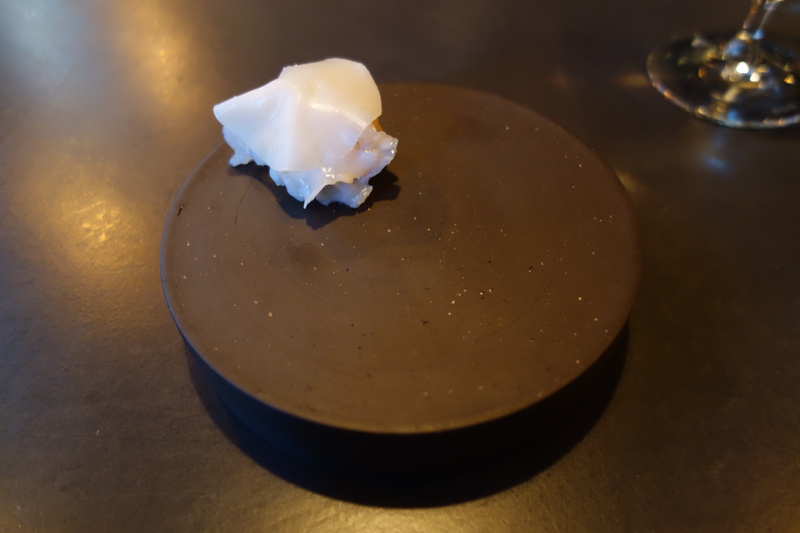 The format that enables the most communication and empirical feedback on new dishes and presentation, is the table of small bites, the chef’s table. Demand: I estimate about 60% of fine-dining patrons are well-heeled professionals, more scarce of time than money. 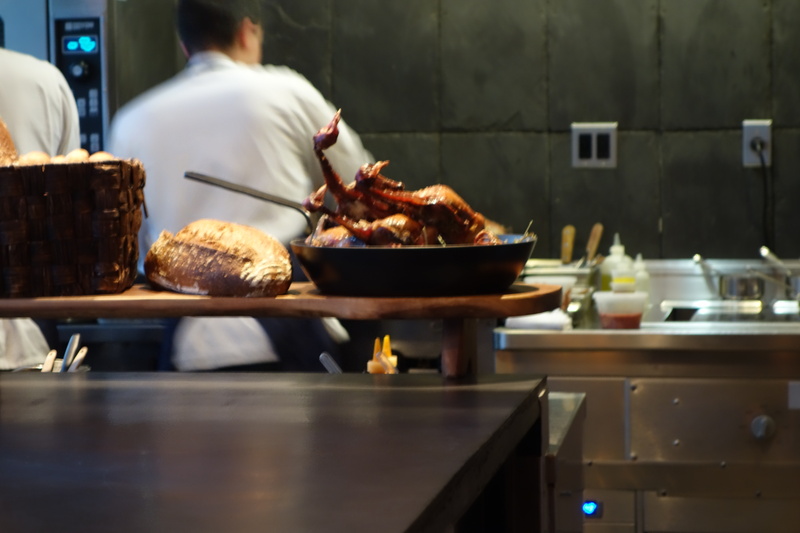 They will ceteris paribus prefer to maximise the amount of novel ideas they imbibe and consume per unit of time, which also benefits the chef’s table format. 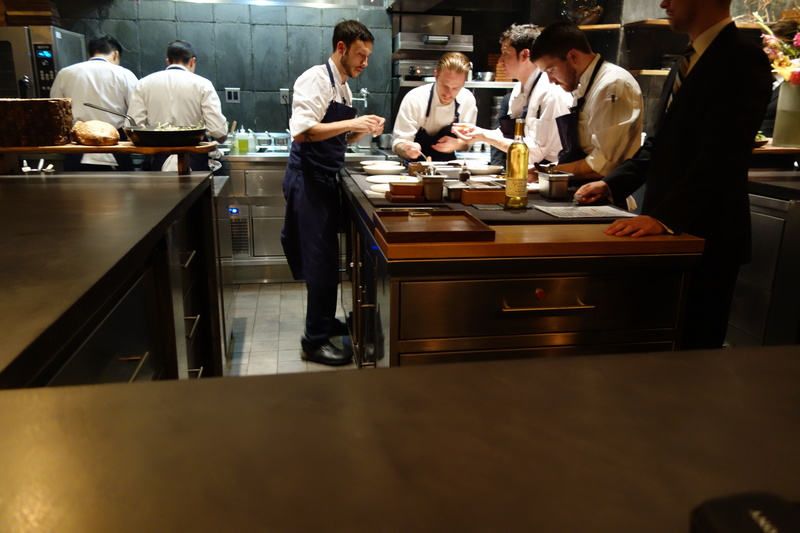 Chef-watching: it is enjoyable to watch skilled artisans prepare your food, or tweezer decorations in. 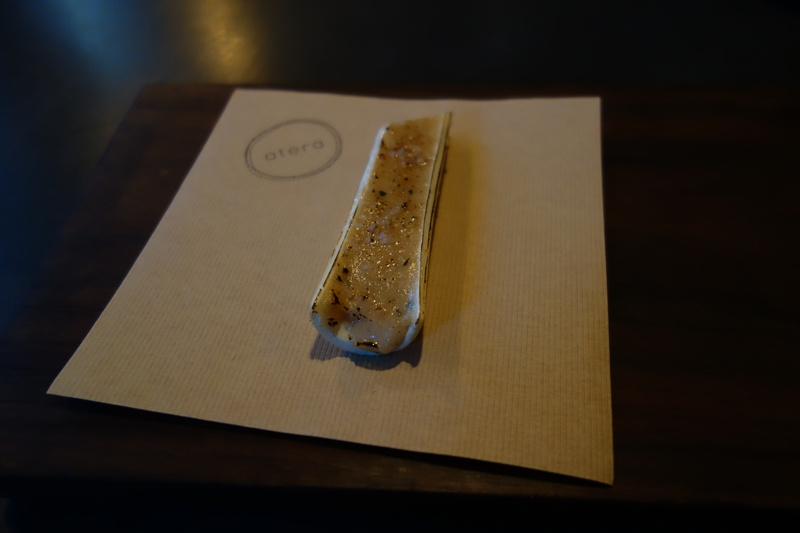 atera is one of a bunch of high-end chef’s tables in New York which have won great acclaim – think Momofuku Ko (2* Michelin), Brooklyn Fare (3* Michelin), atera (2* Michelin), Blanca (1* Michelin) – for their innovative preparation of dishes. The format is perhaps many chefs’ dream, being given complete license to experiment with food, with appreciative and adventurous customers. 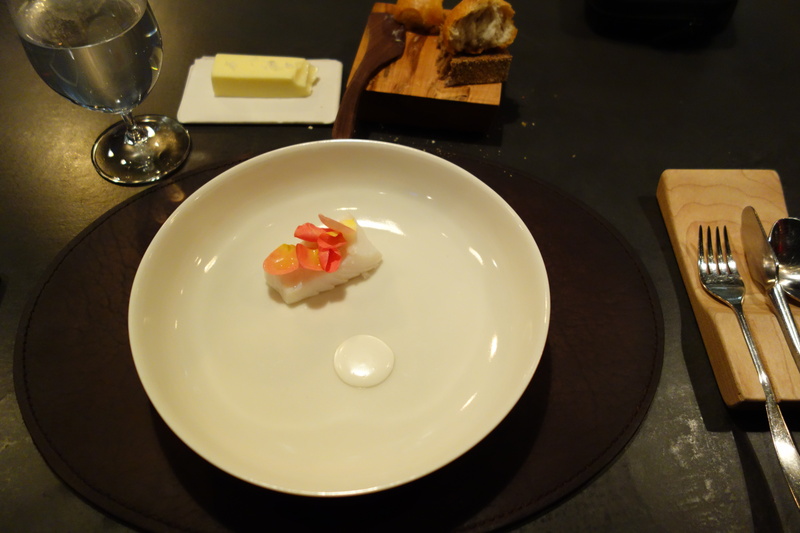 How will chef’s tasting counters change in the medium term (3-5 years)? Ruth Reichl thinks that they need to evolve beyond providing great food and wine, to providing more interactivity and theatre. 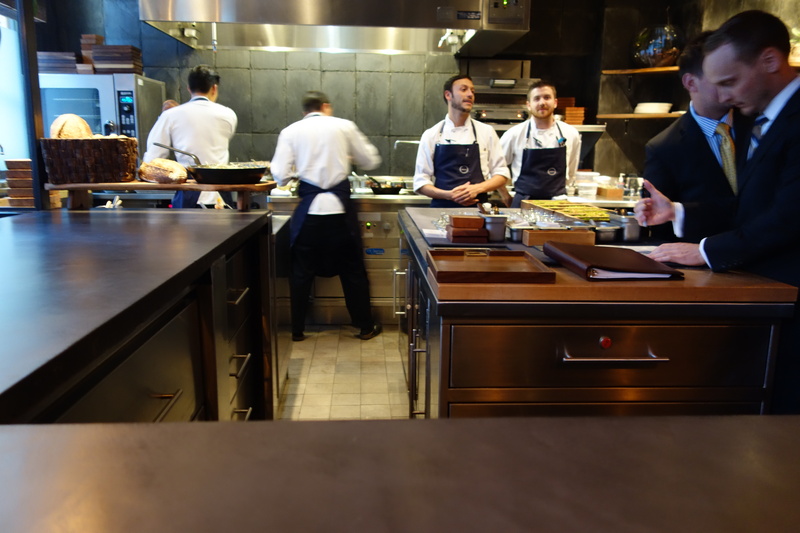 What I like about chef’s tables is that there is simply more interactivity with the chefs. You get to ask questions about your food, find out what went into the making of your dish, and so on. 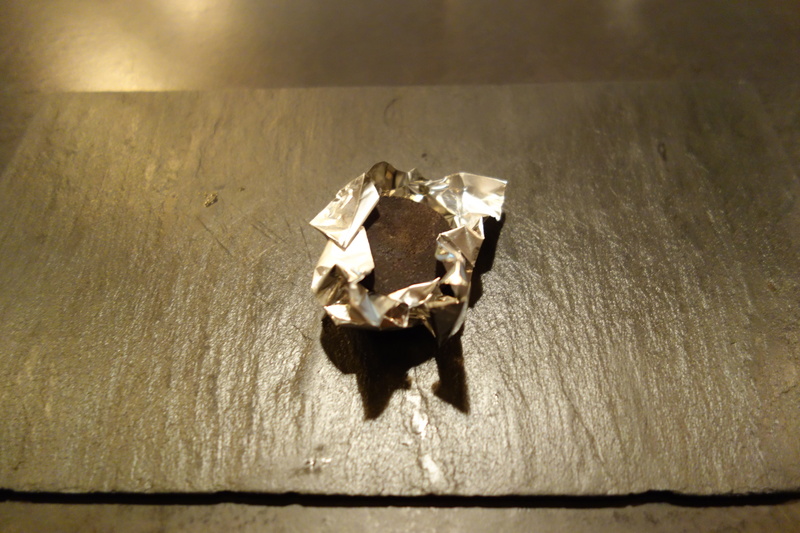 The best experience along this line that I had in 2013 was at the Tapas Molecular Bar in Tokyo in June [link], where I felt completely free to ask Chef Hashimoto any questions about his molecular cuisine.. 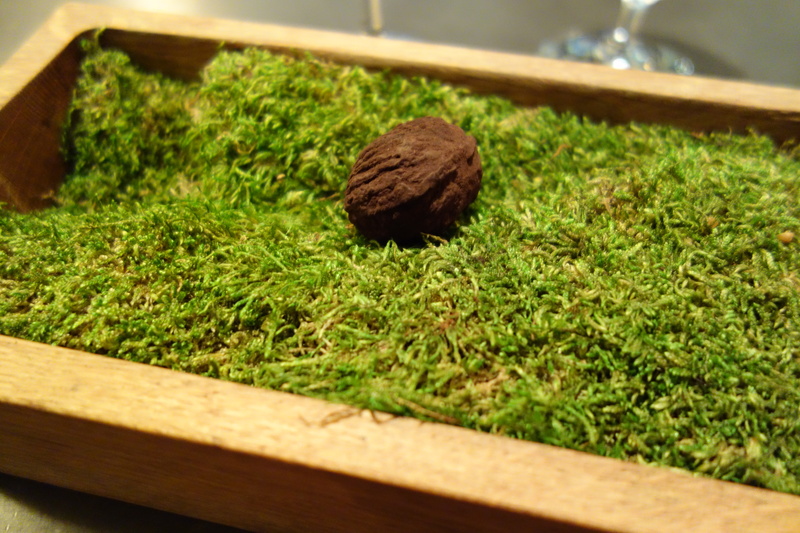 The restaurant: atera opened in May 2012, and made quite a stir when it got 2* Michelin in the 2013 guide. 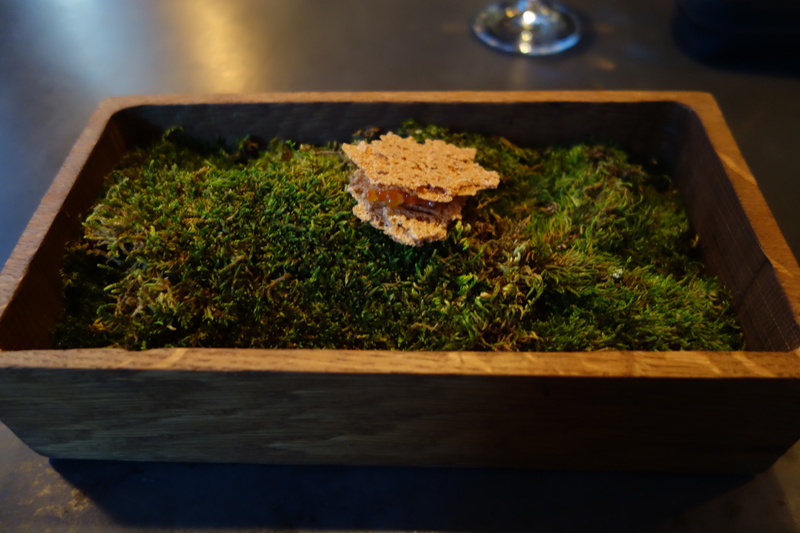 The chef: Matthew Lightner, formerly of Portland, has done stints in Mugaritz and noma. He started out in 2012 trying to forage for atera, but it has proved a bit troublesome to find ingredients in NYC, and now he relies on the (still excellent) option of farmers’ markets in NYC. The area: TriBeCa, despite being one of the most desirable celebrity zipcodes, seemed quite a desolate area, based on evidence from a Saturday night. Perhaps it was all the construction on Worth Street. Beer & Buttermilk Macaron | Creme Fraiche, Caviar. Texture and taste. The macaron shell tasted like Chinese prawn crackers, well complemented by sourness of creme fraiche. A very pretty presentation of pickled beet. Light sourness. 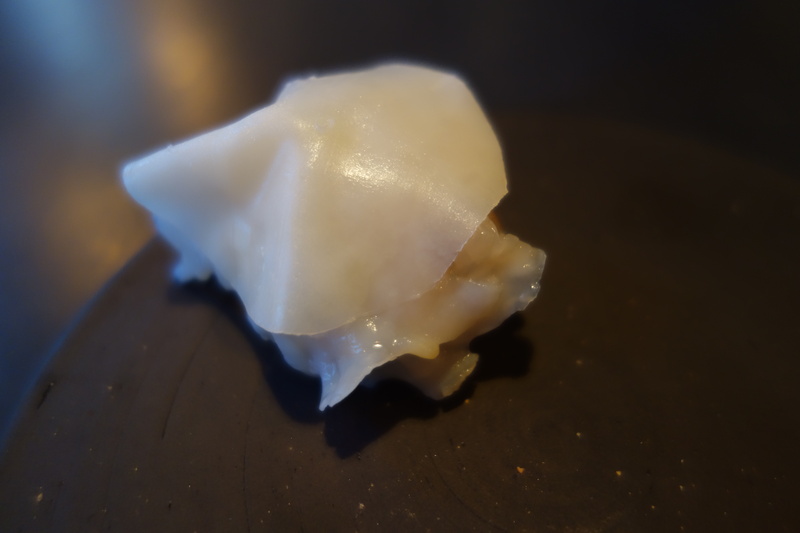 Geoduck had a crunchy texture approaching dried jellyfish. The air baguette had the texture of a Chinese fortune cookie. Well finished by Pork fat. This dish transported me to memories of oriental food, especially of Chinese New Year celebrations in Singapore, where geoduck was an occasional ingredient in the mandatory lo-hei salad on Chinese New Year’s Eve. 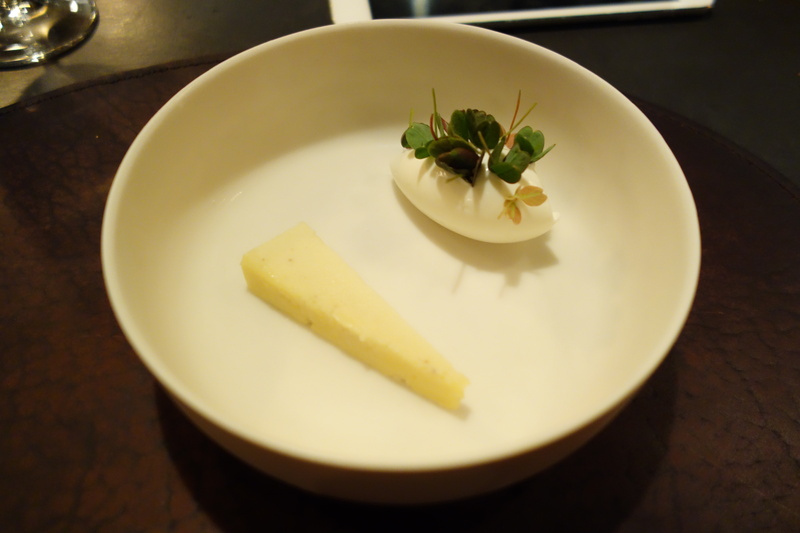 Strong grassy taste from ramp. Amerynth is a cousin grain of quinoa. The best. 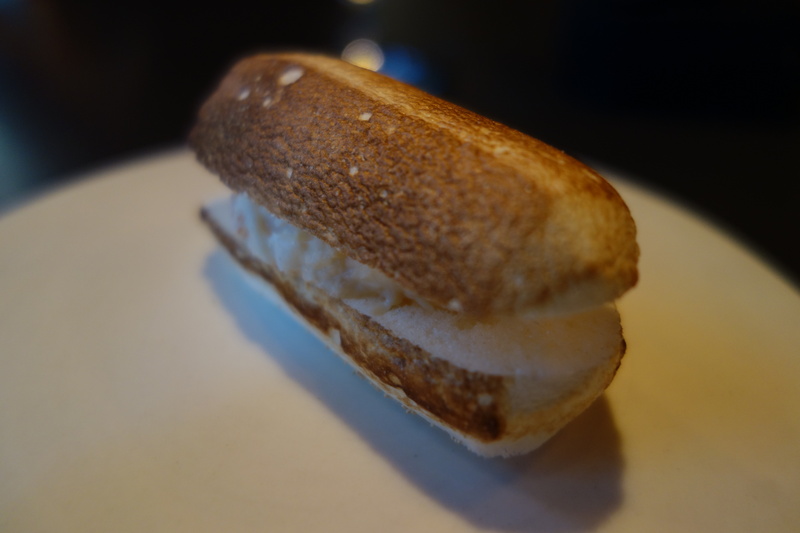 Sweet crunchy lobster, contrasted with an airy meringue sandwich. I would pay for a full size meringue lobster roll. Sous-vide the beef tendon for 24 hours, then put it in the dehydrator. 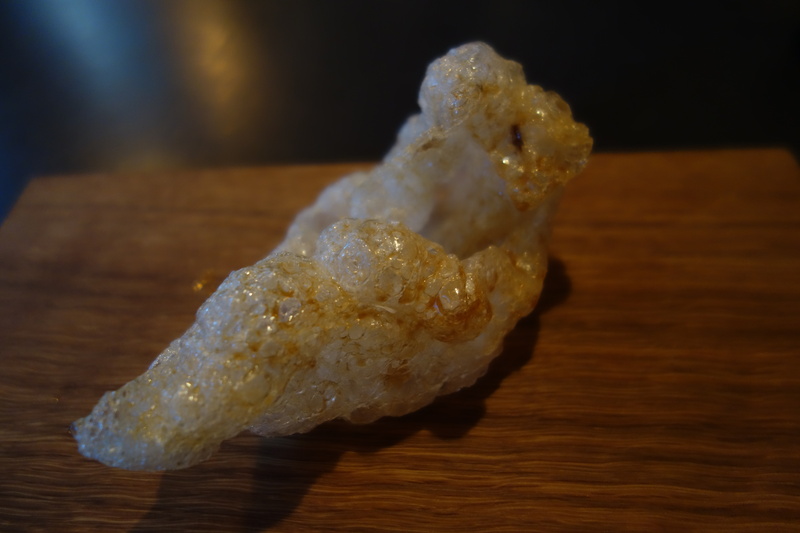 Deep fry it, and it expands, like chicharones. Imaginative technique. 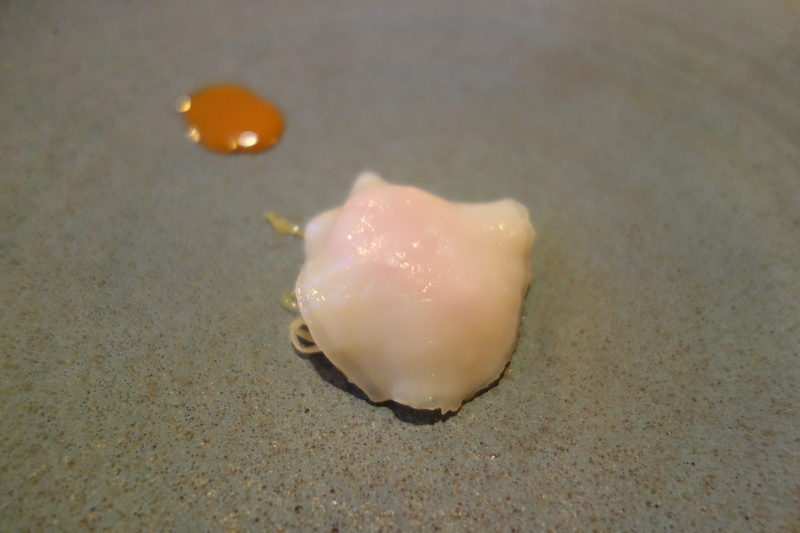 to get beef tendon into this form. 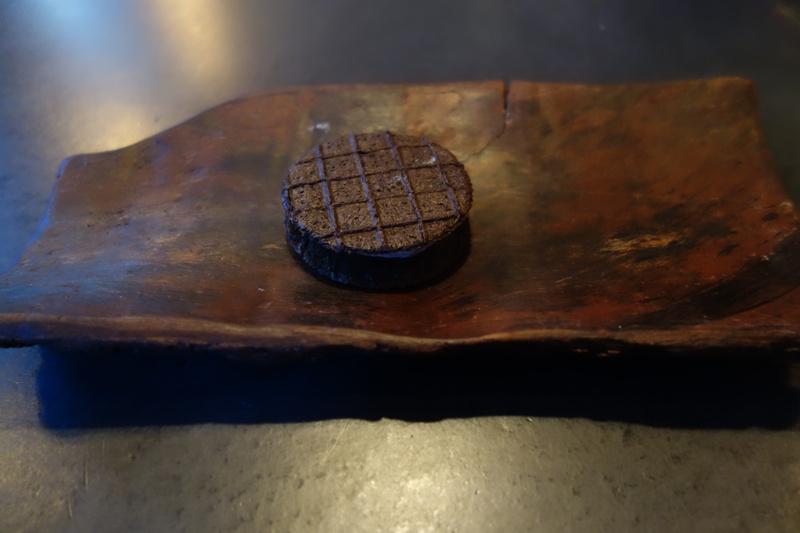 Stunning flavours coaxed out of the pig blood wafer. 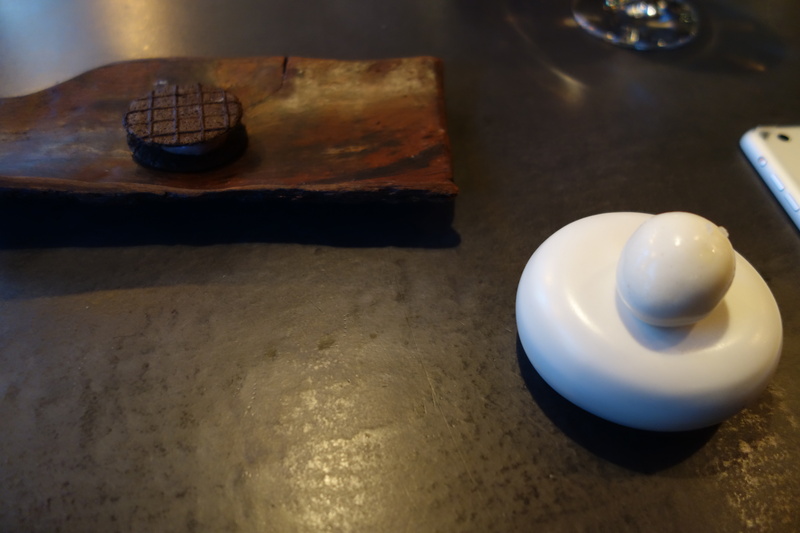 The slightly sweet biscuit contrasted with the meatiness of chicken liver to give an uncanny resemblance to a chocolate oreo cookie. A seeming piece of bone is actually sculpted heart of palm. Crunchy, cradling delish marrow. Fishy ham. A creative preparation of cured swordfish, to achieve the ham taste. 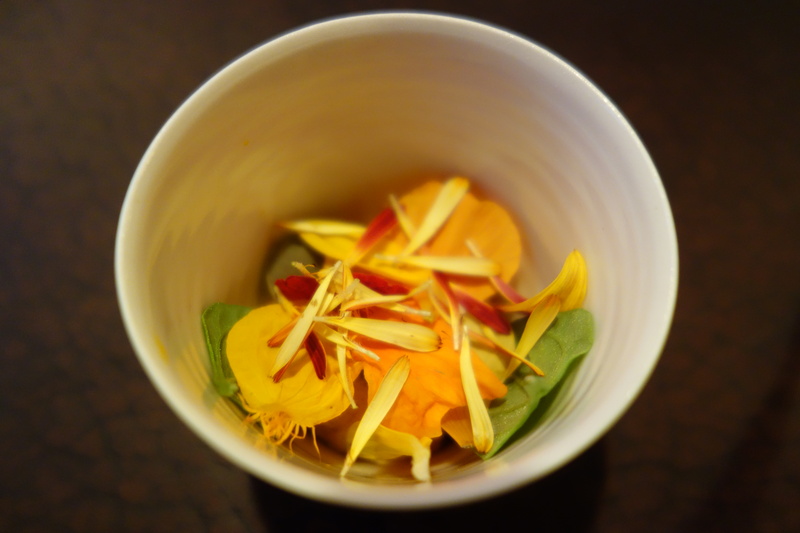 A delicious combination of corn cream and peach, with scent notes from the dianthis. An anise flavour comes straight from the dill flower. 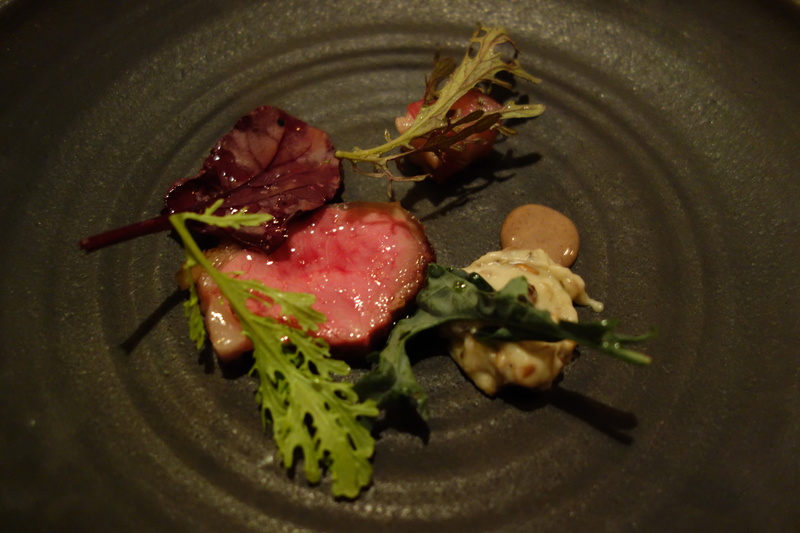 A medley of herbs such as sheep’s sorrel decorates the dish. 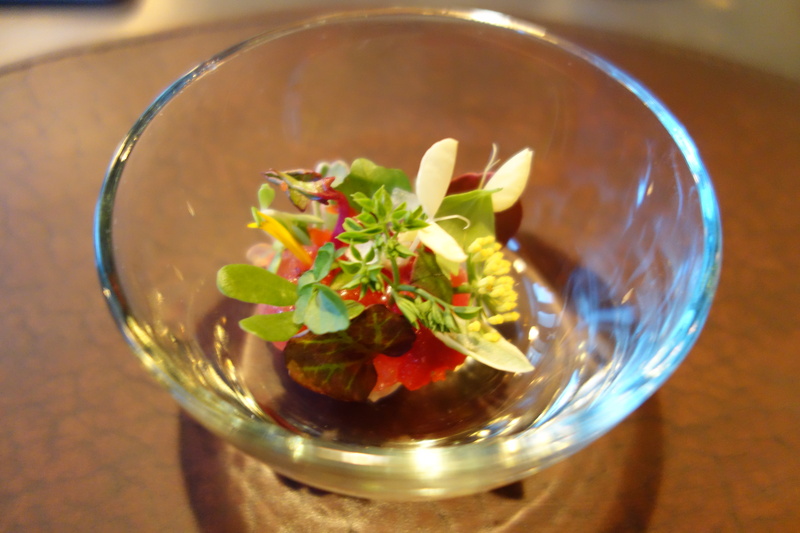 The central axis is a tomato jam with fresh blue fin tuna, with a strong helping of fleur de sel underneath. A visual pun: it is confusing when you take a bite, if you are going to taste clam, pickled garlic, or almond. Full marks for presentation. 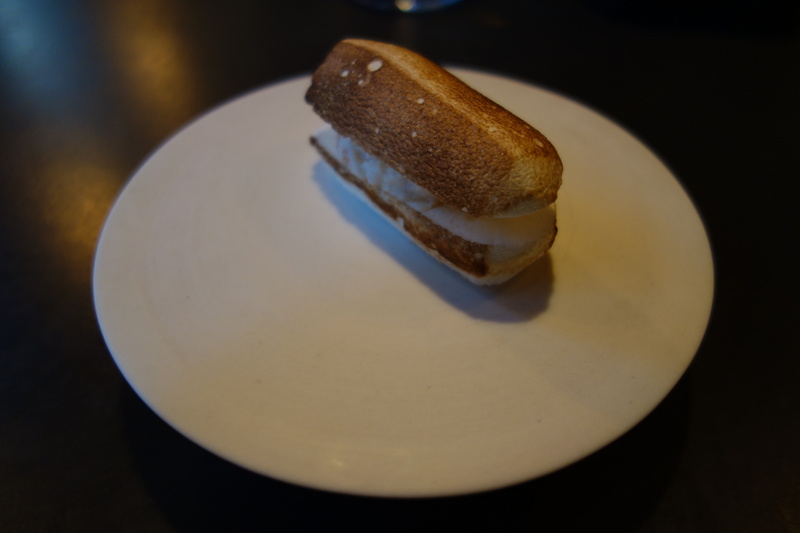 Tastewise, it was quite average – the almond was problem, being much harder than the rest: Imagine biting into a clam sandwich, with pickled almond as the bread. 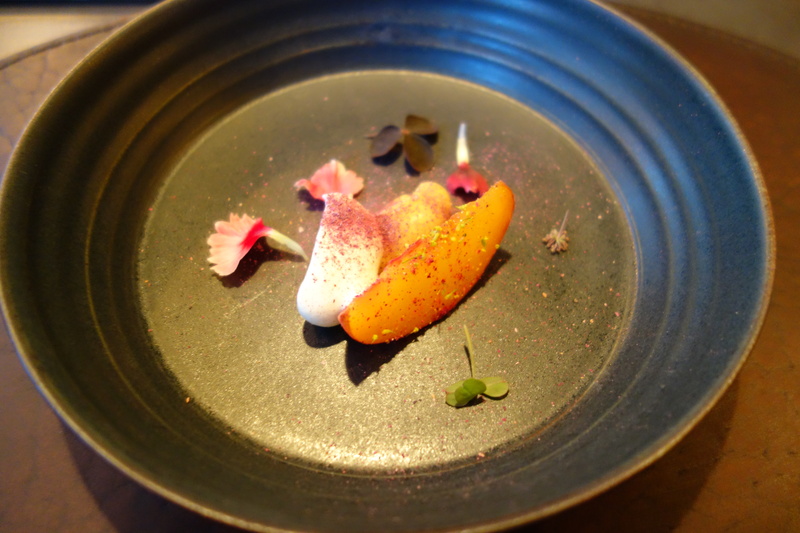 Santa Barbara sea urchin and carrot was an inspired combination, and was beautifully presented. For that alone it would have gotten a perfect rating. 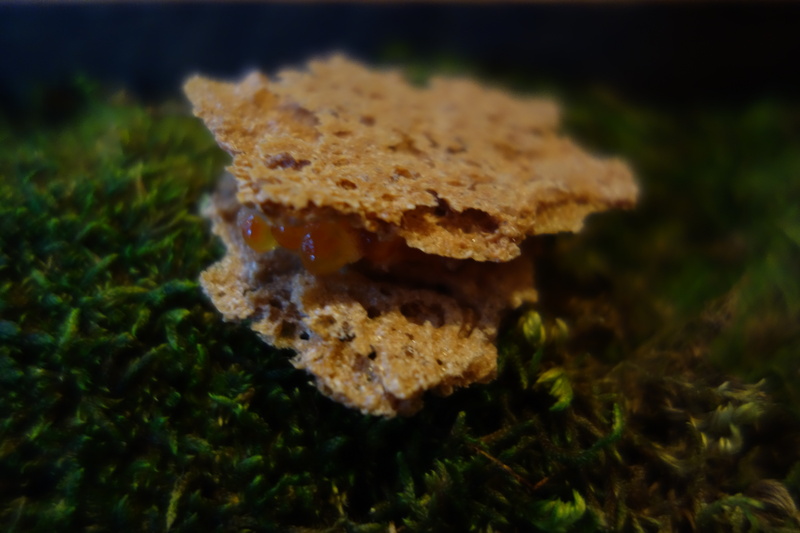 Fresh spongey texture of uni, with a carrot-miso paste mix. However, in the night I was there, a whole slew of dishes were peculiarly oversalted. Salting was a problem with this dish, which had too much soy sauce. 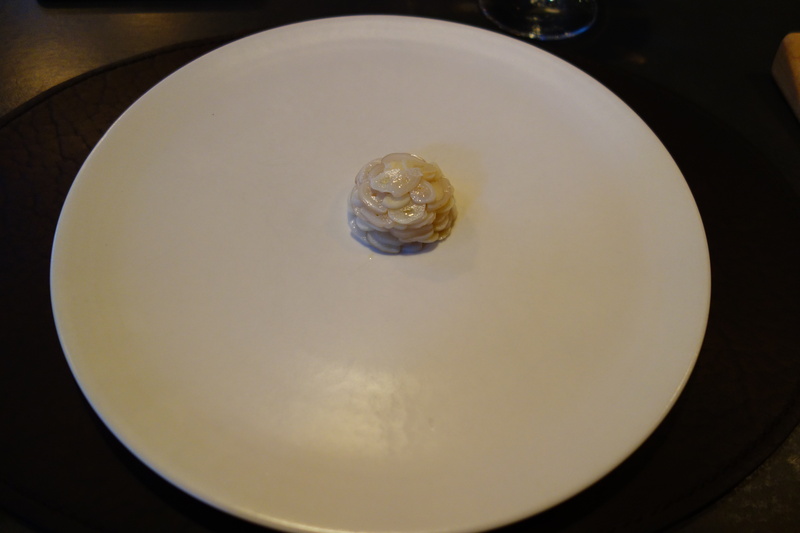 Diver scallop gently warmed over coals, with hazlenut butter and scallop roe underneath, shredded sauerkraut below. Okay. 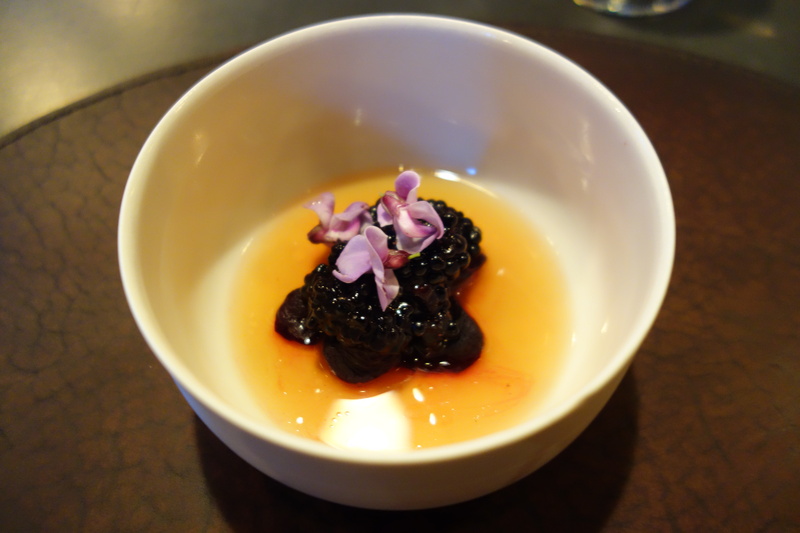 Dehydrated beets, with tart blackberries and brown butter consomme. Very rich. Are dehydrated beets a thing amongst noma alumni? 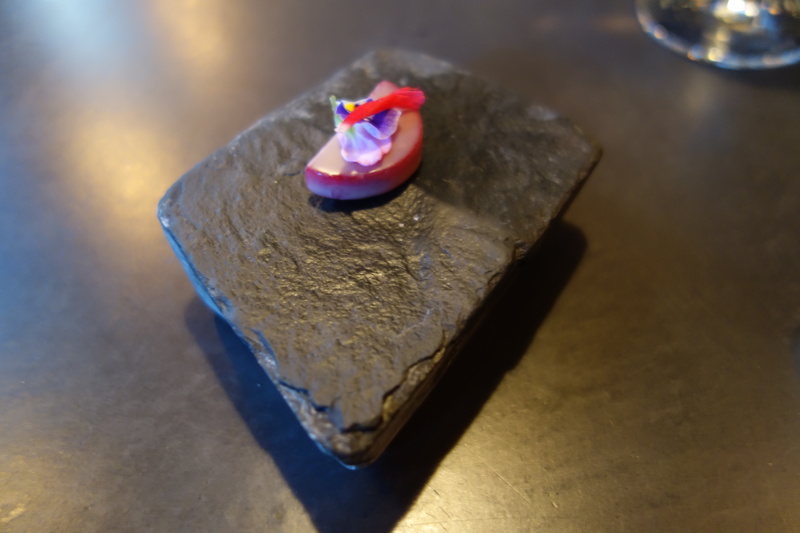 I had a similar dish of dehydrated rehydrated beets masterfully done in Providence’s birch, under chef Ben Sukle. 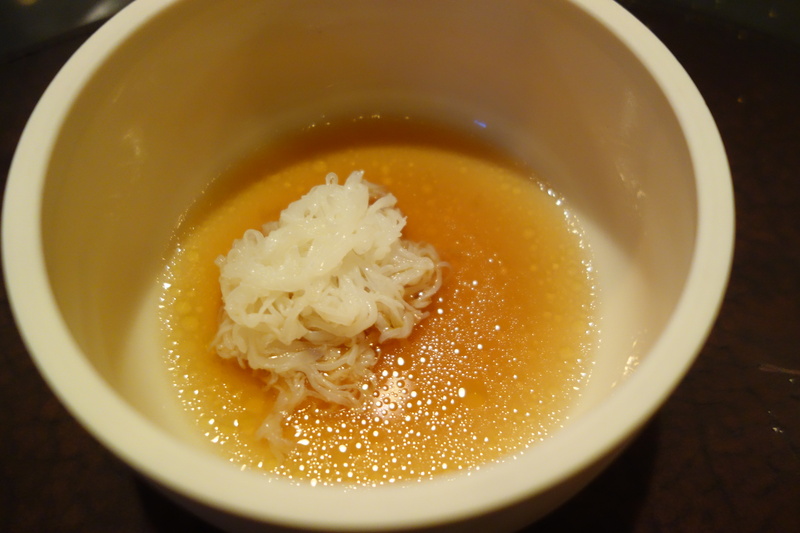 Shredded crab, put in the beancurd film off a boiling beancurd broth (a refined form of the Singaporean dried beancurd skin tau kwa), to become a ravioli. An accomplished and delicate dish. 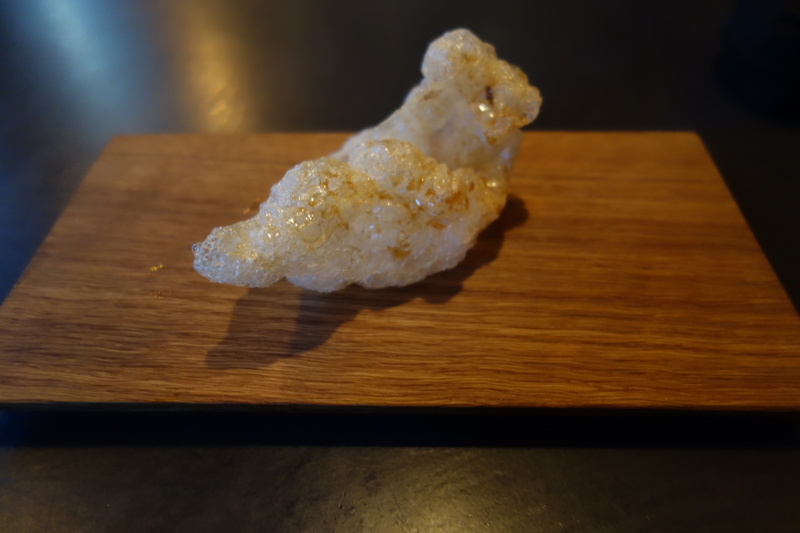 The dashi, however, was again oversalted. 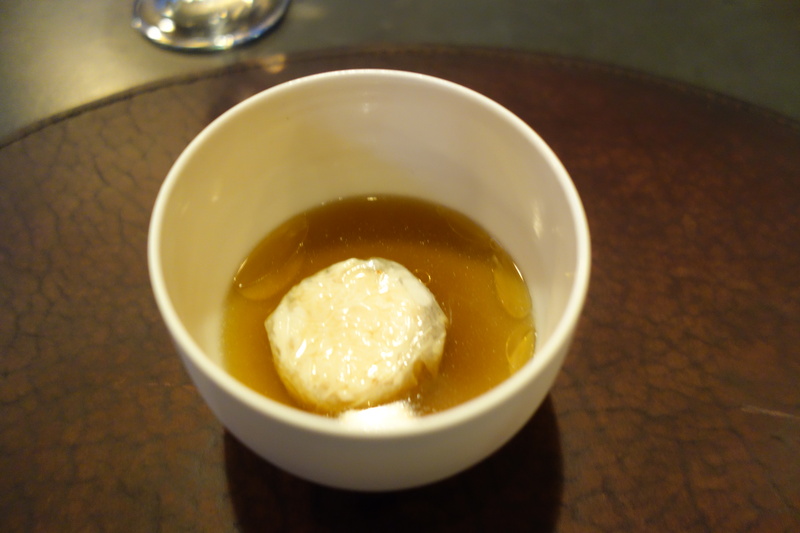 One of atera’s signature preparations. What appears to be rice noodles in soy sauce is acually shredded sepia, or cuttlefish (what’s the difference between cuttlefish and squid?) in a roasted chicken broth. The noodles were slightly crunchy in texture. Oversalty. 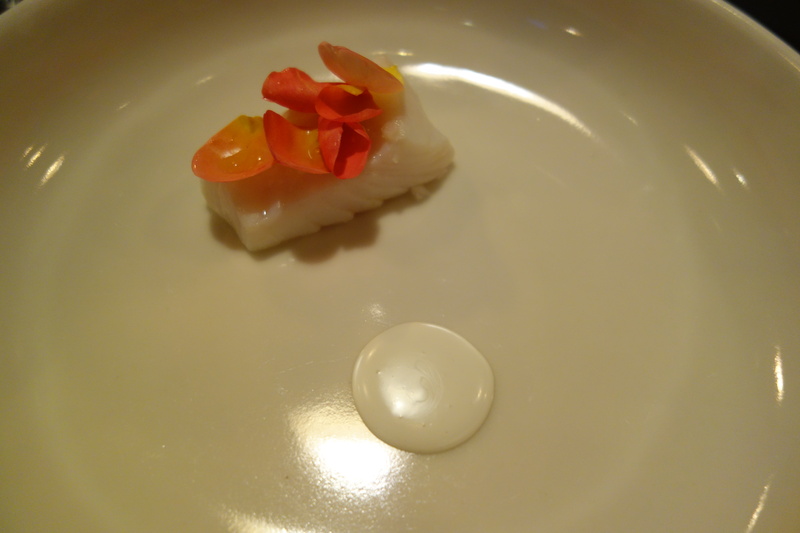 Nova Scotia halibut, with pickled arctic rose petals, and roasted bones of fish reduced to a sauce and emulsified with chamomile. 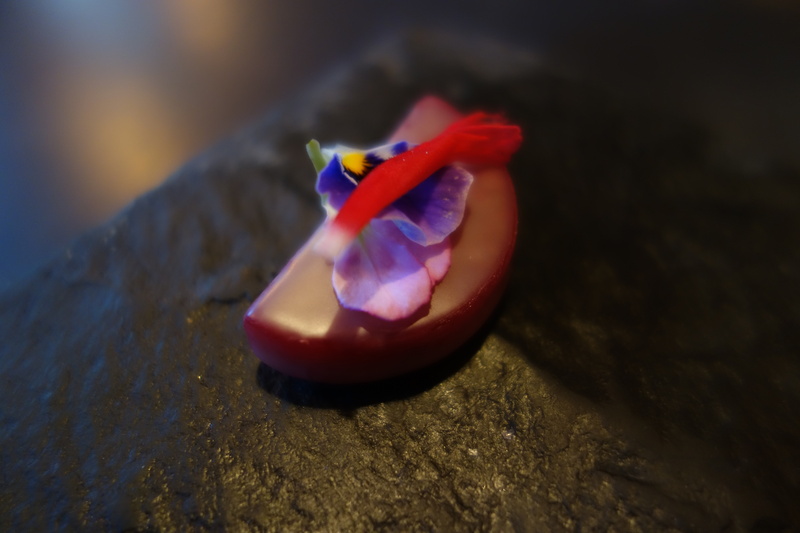 The pickled rose petals had a sensational taste which I hope to try again, marrying the fragrance of Ispahan with a fruity sourness. Halibut was well-cooked. 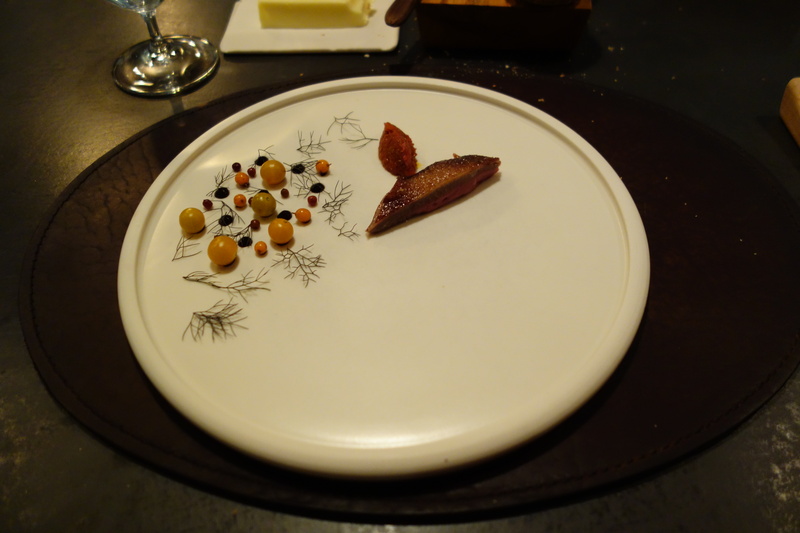 The centerpiece which we had been waiting for, squab breast. Sinewy to the knife, it was apparently created as a tribute to an art piece [see SpanishHipster for the exact art piece this dish was inspired from]. Again, full marks to presentation. 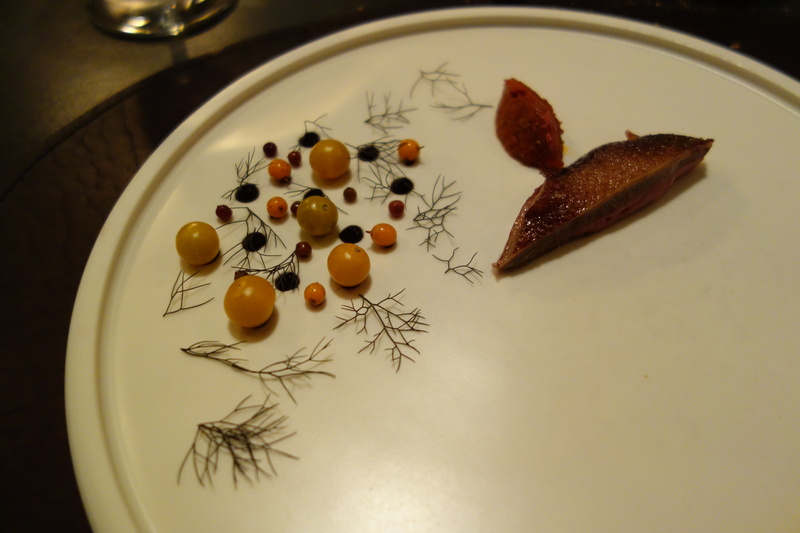 Accompaniments: Fennel, Sea-buckthorn, tart gooseberries, blueberry sauce, black garlic , and a tomato ragout with squab liver, gizzard, & heart. Desserts are said to be atera’s specialty. Certainly, it is unusual that chef Lightner takes the lead in creating the desserts. 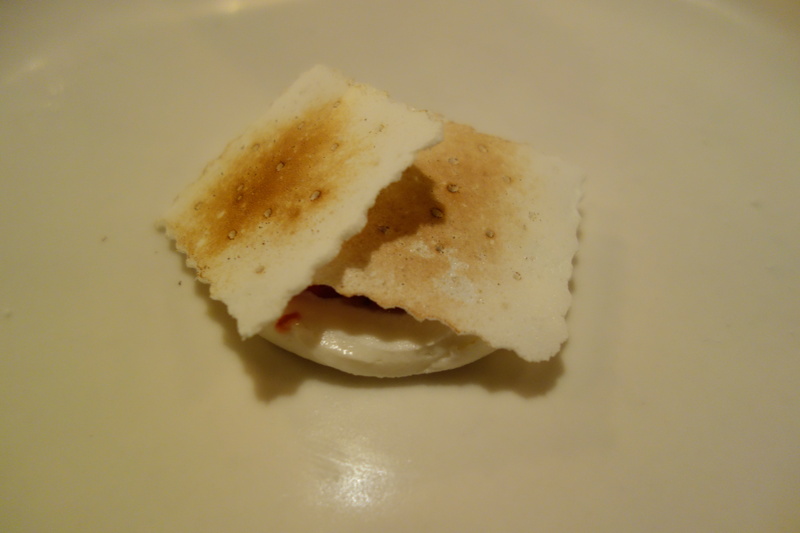 A saltine made of meringue! Great construction. 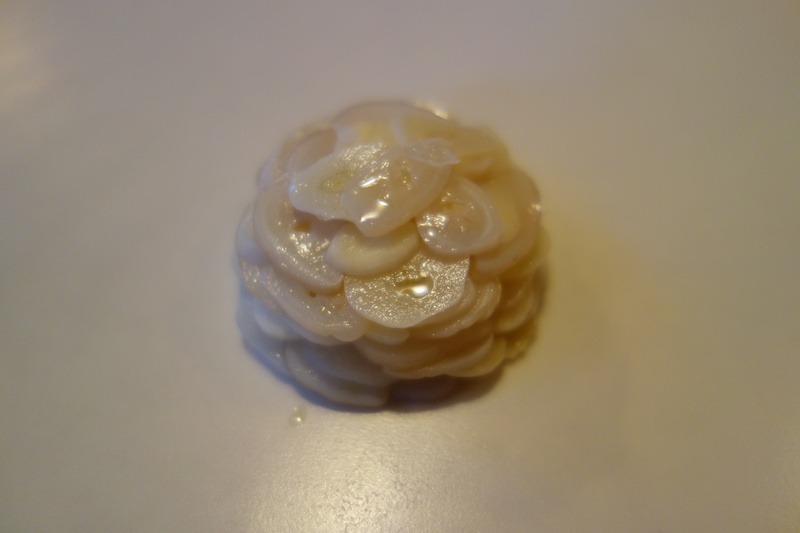 Another atera specialty, mango jam within goatsmilk ice cream and a sugar shell. 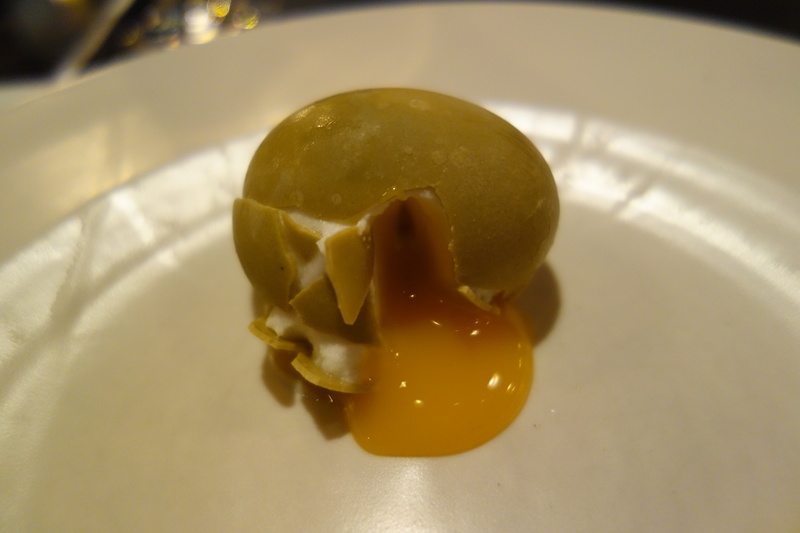 An innovative riff on the cracked sugar shells desserts that have been all-the-rage recently – I’ve seen them served at least thrice in the past year at the Joel Robuchon Restaurant [Macau], RyuGin [Tokyo – report], and Restaurant Andre [Singapore – report]. This photo-realistic facsimile of egg was amazing. Toasted walnut sundae, with celery root dehydrated and then rehydrated in walnut liquor syrup. 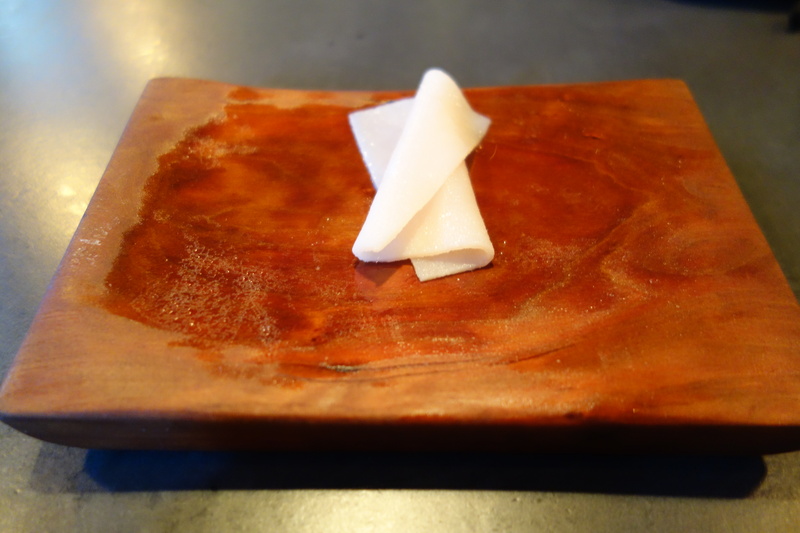 Celery root then took on the beguiling appearance of walnut, making them indistinguishable except to tooth and tongue. 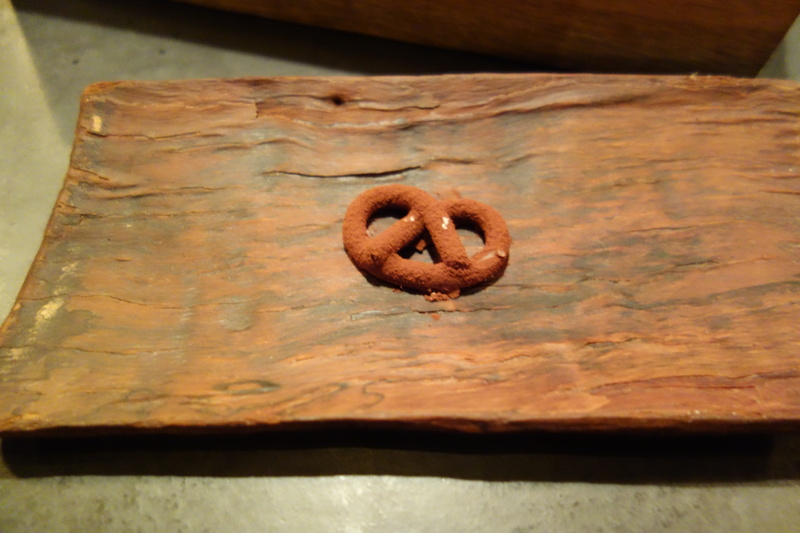 Despite being small, these pretzels packed a delicious salty punch from the caramel. The plating: If I were to sum up atera in a single sentence, it might be that “presentation is as much substance as taste”. 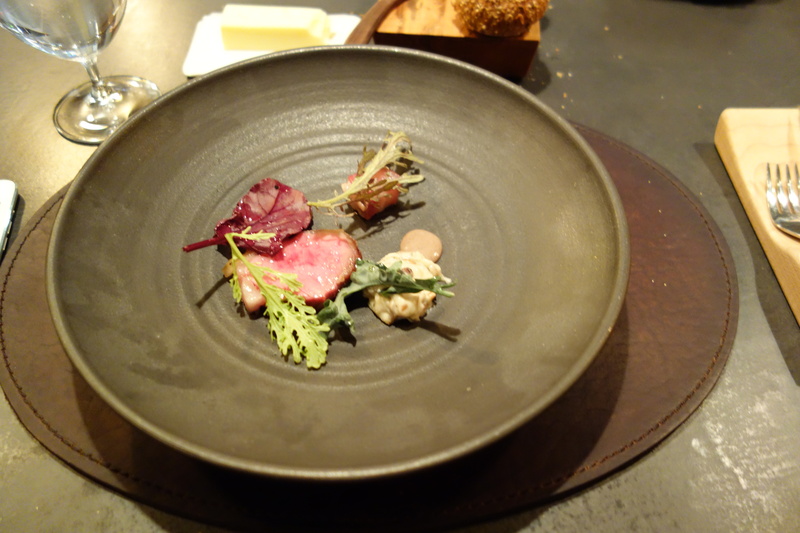 Plating at atera is of paramount importance; to pick a few dishes at random – the squab art piece, the celery root that was put through the wringer of dehydration and rehydration to look like walnut, the cracked egg – were all masterclasses in plating and presentation. 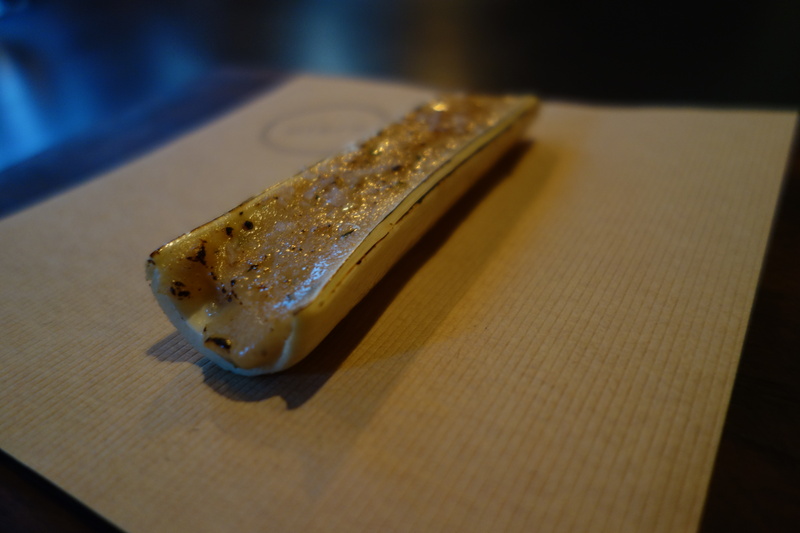 If one eats with one’s eyes, one will eat very well indeed on plates such as the razor clam, garlic, almond pile. The meal: I enjoyed the pre-meal snacks, and the desserts a lot more than the mains, which I believe suffers from a problem of over-salting. 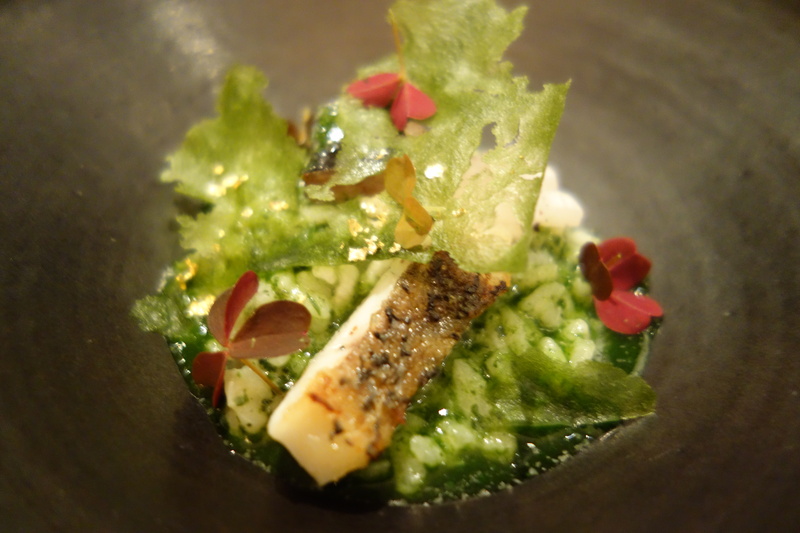 Certainly atera does not go for the heartiness of a plate of pasta in a restaurant like Marea, but instead focuses on transmogrifying its natural ingredients to make jokes, to play with our conceptions of what food should look like, our notions of verisimilitude. 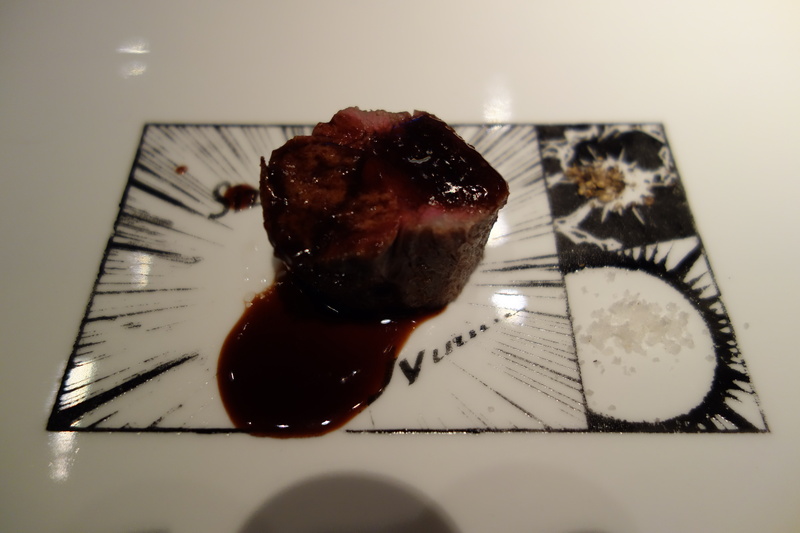 I rate atera top-class on visual artistry, but this diner is more accustomed to a different idiom – one of heartiness – for at least some of the main dishes. Heartiness is the generosity and warmth of comfort food – think a whimsical chunk of steak at Tapas Molecular Bar, or a warm kelp risotto at Restaurant Andre. 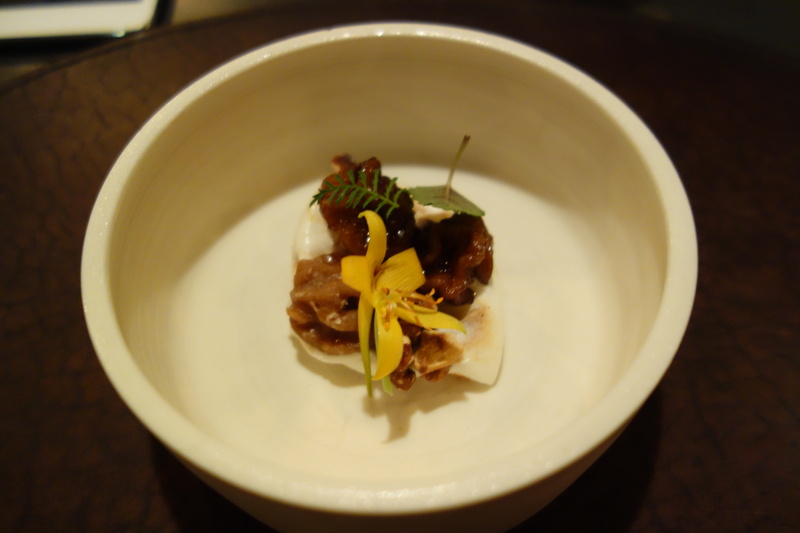 That atera does not serve a single hearty dish, but relentless aesthetic small bites, was a horizon-expanding concept. It will certainly need to win over and re-educate fine-diners to its aesthetic philosophy. I foresee increasing enthusiasm for this kind of meal amongst the fine-dining crowd as an experience, but I doubt it will attract a large group of regulars. 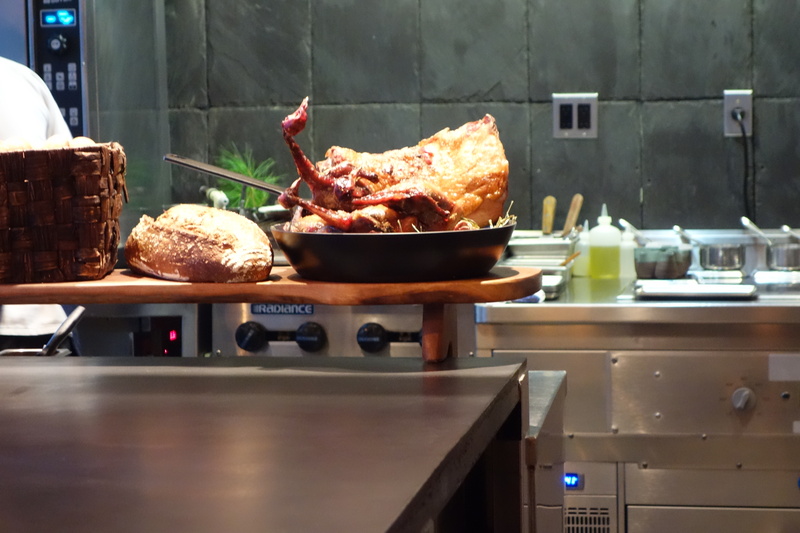 atera’s aesthetic philosophy will attract less regulars, but educate a wider base of diners. 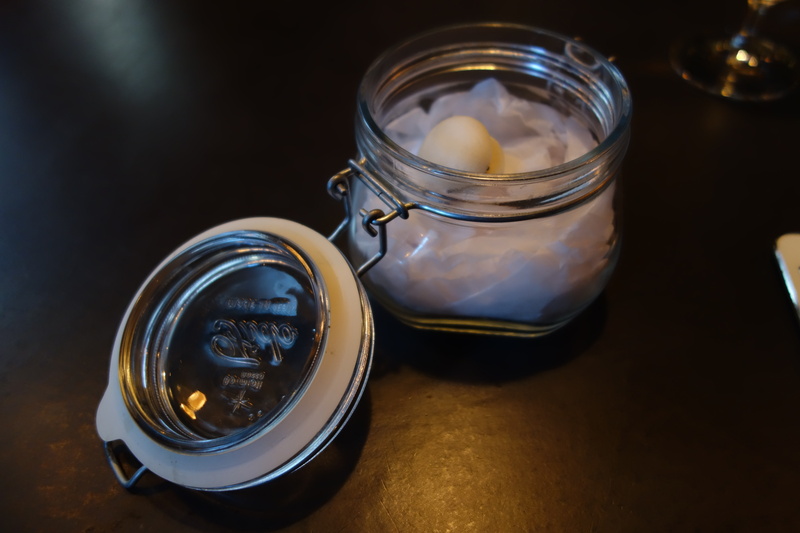 Expertise: The kitchen is especially skilled in meringue preparation; certainly the yeast meringue for the lobster roll and the saltine meringue for dessert were amazing pieces of craftsmanship. Spanish Hipster’s September 2013 visit to Atera – As always, this blog has amazing visuals – written by a former RISD alumnus, Elise Porter! 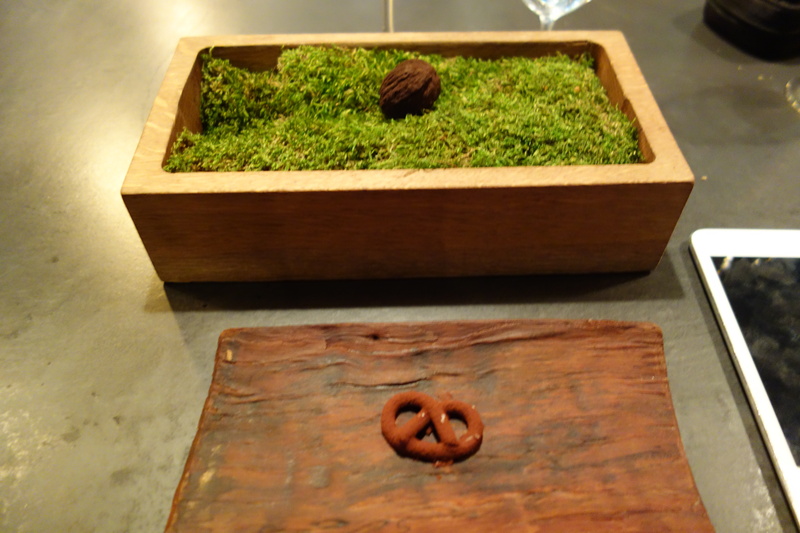 Historical review of the 2012 Atera menu by Docsconz. The Toqueland interview with Matthew Lightner.